Centerstream presents this detailed look at the inner workings of the famous musical instrument manufacturer of Kalamazoo, Michigan before World War II. For the first time, Gibson fans can learn about the employees who built the instruments, exactly where the raw materials came from, the identity of parts vendors, and how the production was carried out. 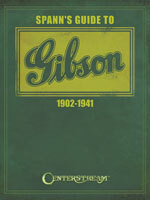 The book explains Gibson�s pre-World War II factory order number and serial number systems, and corrects longstanding chronological errors. Previously unknown information about every aspect of the operation is covered in-depth. Noted historian Joe Spann gathered firsthand info from pre-war employees, and had access to major Gibson document collections around the world. Long time Gibson experts, as well as casual collectors, will find this volume an indispensable addition to their reference shelf.